Do they have a process to contribute such profiles like the one you created to fix the crappy defaults they ship? I pulled the trigger today and bought S3D. The first time I tried to print something went horribly wrong for some reason I still don't understand. As soon as I started the print, first the extruder motor made a lot of noise (skipped steps), then the bed homed and then continued to move further down (causing the z motor some anguish), then when it raised the bed it crashed into the printhead. Second attempt was better, even though I didn't really change any settings related to that. Only retractions were extremely slow. Apparently speeds in S3D are given in mm/min instead of per second. Third attempt is running now, and so far it's looking okay. I just made some more adjustments to the startup script, because it still crashed into the bed clips. And I adjusted it to move the head into position before heating the bed and nozzle, like the default with cura. Also, for some reason X0 Y0 is in the back left instead of the front left, though that doesn't really matter much. It appears S3D doesn't use the G10 and G11 for retract and unretract. This is unfortunate because then you can't change retraction settings mid print. Has anybody here got that working? After all that, read all the pages of this post (it will help you get an idea of how to setup it. My profile posted on the first page has a different gcode start that will make hotend hit the bedclips on um2. Also, remove all auto crap asap and open advanced mode asap. You can make a replace script to replace the retractions to the g10 g11. Ofc you first must make the speed and amount fixed so the replace can find exactly the data it searchs. Anyway... How can a um2 do retraction while wiping if is limited to that gcodes??? Neotko wrote: Also, remove all auto crap asap and open advanced mode asap. I've read through this thread before I bought S3D, watched a bunch of tutorials on youtube also, so I know at least a little bit what I'm doing. Good point on the wiping retraction. That can't be done using G10/G11. I will just leave it for now, once I've found the correct retraction settings I won't need to adjust them mid print anyways. I tried to use this post from S3D to make my own starting script. For some reason the code they show there doesn't fully work. This is what I tried to set it to. Unfortunately, the tag [bed0_temperature] isn't replaced by the actual value, causing the bed not to warm up. So I have to set that to a fixed value at the moment. I only use PLA really so it's not much of a problem for me right now. This is the G-Code that will be ran after heating up but before your print. Traditionally, this will consist of homing the printer, potentially purging the nozzle, wiping the nozzle and running an auto-leveling function if the printer supports it. In addition, you can add PID values, or set toolhead offsets here if you'd like to. If you're not a fan of the fact that Simplify3D heats up the bed/extruder, than runs your starting-script, you can customize this, by using the commands below. If you have the commands for [bed#_temperature] or [extruder#_temperature] in your starting G-Code script, the software won't add in heating commands, it will just run off of the commands in your starting script. The hotend temperature is set correctly this way, S3D replaces the tag [extruder0_temperature] with 200 (which is the value I have set in the temperature tab). For the bed this doesn't work, which is a bug I guess. Ah, I found it. 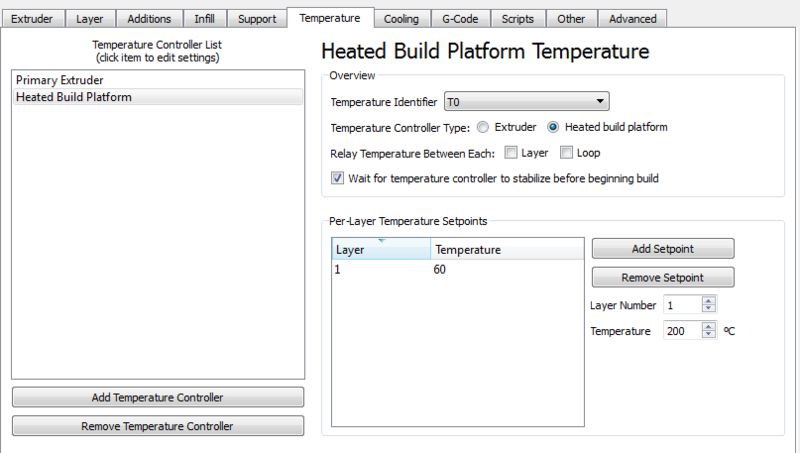 On the Temperature tab, under the "Heated Build Platform" settings, the temperature identifier was set to T1. I set it to T0 and now it seems to work. T0 is bed? No idea I never use that script on the gcode, if you don't add the temp settings on start gcode s3d will add the heating sequence bu itself so dunno. Nice info if someone needs to do it that way. In the overview, there is the Temperature Identifier dropdown menu. You can choose T0, T1, T2, etc. In the starting script, you can use the settings from this tab, by using the tag [extruder#_temperature] or [bed#_temperature]. The # here corresponds to the temperature identifier you chose in this menu. You can add more extruders, e.g. if you have a dual extrusion print, but then you need to choose a different identifier (T0 for the first, T1 for the second).You can also add another build plate. In practice this might be to set the temperature for a heated chamber or something like that. So in my case, both the bed and the extruder have identifier 0, so I use those parameters in the starting script as [extruder0_temperature] and [bed0_temperature]. If I were to add another extruder, I would give it identifier T1, and I could access it by using [extruder1_temperature], etc. I've lost more time just configuring it to my printer versus seeing all these amazing things it can do better than Cura! That said...Neotko made a profile for the UMO Does the default UM2 work well?